La-Garde-Guerin is a village in the Parc National de Cevennes, in the Lozère department of Languedoc-Roussillon, in the Massif Central and officially listed as one of the most beautiful villages in France. Perched on a rocky plateau in a beautiful location, it is one of several small attractive villages to discover in the Cevennes National Parc. 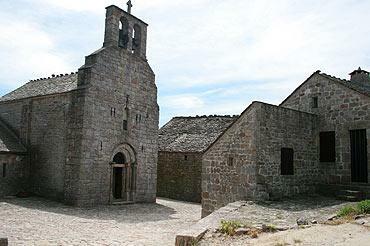 It is also a very isolated place, reached via an approach road along the scenic Gorges de Chassezac. Note that cars are not permitted in the village itself but there is a car park right next to the entrance. Poised high above the gorges, the fortified village of La-Garde-Guerin dates from the 12th century although the houses we see today date from the 16th century - more specifically the years from 1595 to 1597 when they were all rebuilt after damage suffered during the wars of religion. 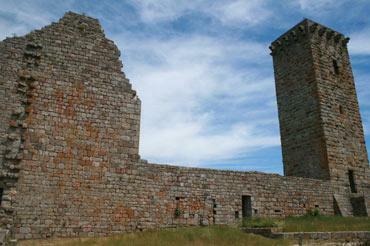 The village is entered via gates in the fortifications - the Porte du Rachas and the Porte Saint-Michel. 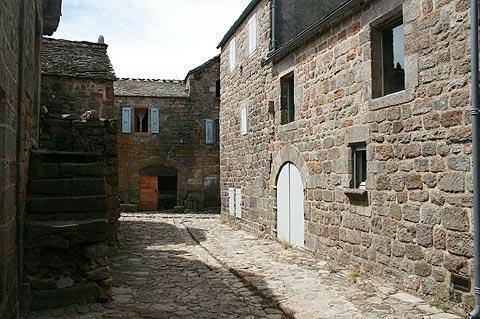 The fortified walls are still almost complete around the village and inside you will discover narrow, cobbled streets lined with sturdy medieval houses, the remains of a castle, and a small roman style church (the Church of Saint-Michel) that still preserves its original 12th century appearance. Apparently the fort and the associated watchtower was originally built for a local group of soldiers who protected important travellers and goods being transported in the region. In return for this protection travellers had to pay a toll to the soldiers: some historians describe the community as important protectors, while others refer to them as bandits. It was only after the revolution that the community of soldiers was disbanded. 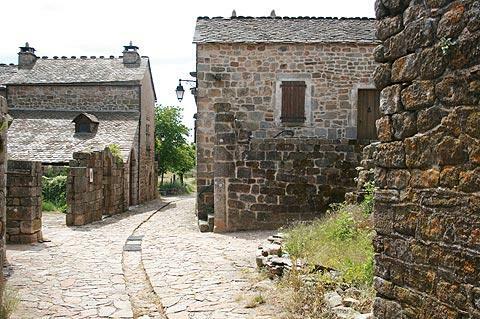 There are various other features of interest in La Garde-Guerin including the lavoir, the bread ovens, an ancient stone cross at the entrance and lots of individual features on the stone houses (see the tourist information board at the entrance for details before you enter the village). 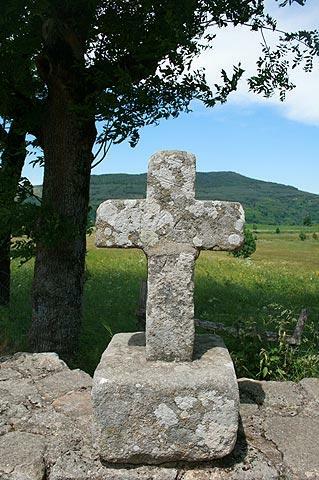 Within the village you can amble behind the castle for views across the Gorges de Chassezac while from the southern edge of the village you can see across to Mont Lozere. France This Way comment: when I visited it seemed almost like an abandoned village it was so quiet as if the inhabitants had left 500 years ago - only about 10 people now live in the village all year round - and nothing much had happened since. Small but perfectly formed, a visit to La Garde-Guerin is highly recommended. After your visit to the village you can travel a few hundred metres further along the road for an even better view of the gorges from the belvedere. Several kilometres below La Garde-Guerin is a large lake where swimming is possible and an alternative view up the gorges from below (from the barrage). 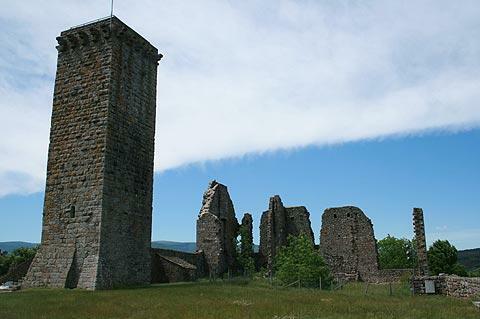 It would be true to say that this region is quiet and isolated and town and villages are quite along way apart: see Parc National de Cevennes for more highlights in the region.